As the days get longer and the sun is out, horses will be enjoying the perks of being turned out more. This could be a potential danger for horses at risk of laminitis or overweight. Recent research has shown that laminitis is as common in horses in the UK as colic. In contradiction to what was previously thought, there is no safe-season for laminitis, and it is presented and diagnosed all year around¹. It is important that owners remain proactive about the prevention of laminitis in every season of the year. The earlier an episode is recognised significantly increases the best chance of recovery. This includes looking out for the perhaps more subtle signs, including changes in behaviour, reluctance to pick up feet, a shortened/stiffened gait and being careful on hard stony grounds. Picture 1. Hoof wall with laminae dissected. The horse’s foot is built from a sensitive (soft tissue inside) and a non-sensitive part (hoof wall). 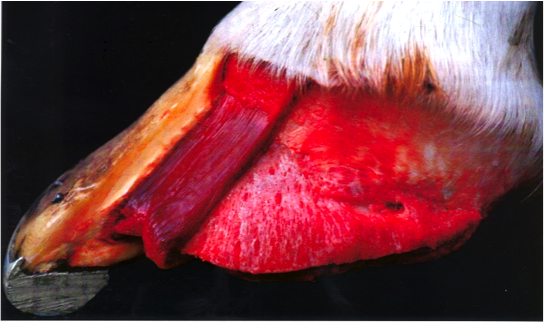 The sensitive parts are called the laminae, which connect the hoof wall to the pedal bone inside (Picture 1). 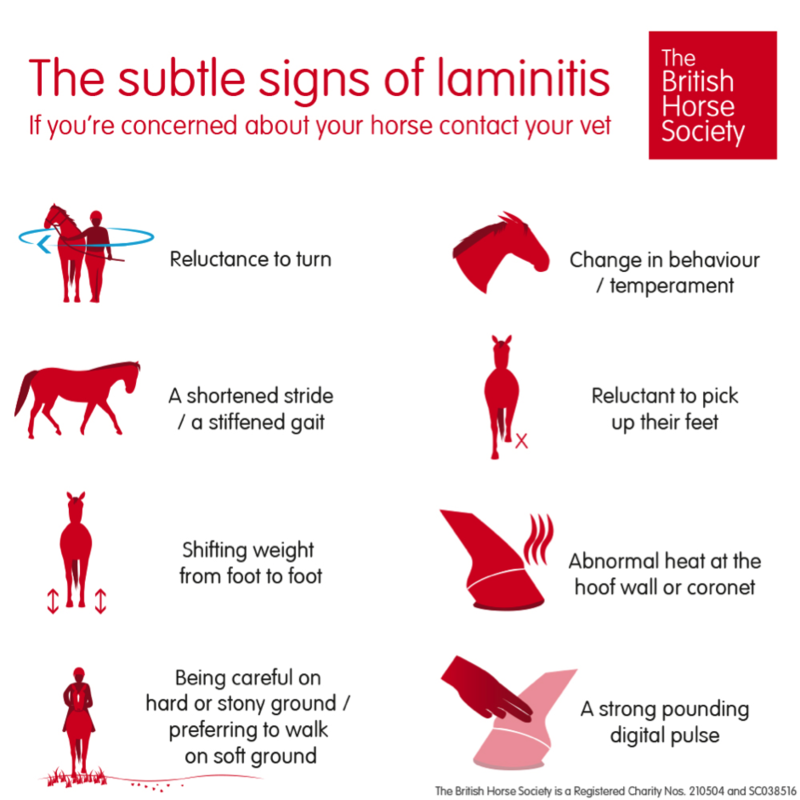 In a horse with laminitis these laminae get inflamed, causing them to loosen the connection. Because of this the pedal bone will rotate towards the sole of the foot. The inflammation and rotation of the pedal bone are very painful for the horse. The rotation of the pedal bone can only be confirmed by taking a xray (Picture 2). Left xray shows normal anatomy with the pedal bone parallel to the hoof wall, right xray shows a rotated pedal bone, where the tip of the pedal bone has penetrated the sole. Restricted grazing in horses at risk of being overweight and laminitis is indicated, ideally horses at risk should not be turned out on grass at all. Strip grazing, limiting the hours of turn out on grass and turning out with a muzzle are advised, but some horses will adapt to this. If you think your horse is overweight, please don’t hesitate to book yourself onto one of our weight clinics!